Apple didn’t make any improvements in the camera of iPhone 6 in terms of resolution, but there are many other features stuffed in the new iPhone 6 and 6 Plus camera. Apple is ready to rock with the new iPhone 6 and 6 Plus, packed with lots of features. But before the announcement of the new iPhones, there were some rumors that the new iPhones will have 13 Mp snapper. Though Apple disappointed in that case and kept it same as iPhone 4, 4S, 5 and 5S, but with great new features. So, let’s take a look at some of the great things in the new iPhone 6 and 6 Plus camera. This time, Apple has made a lot of improvements and changes in their iSight camera. When it comes to perfect light capturing Apple didn’t leave any efforts in that with pixel size is 1.5 microns, same as that of iPhone 5S, and the aperture opening is a fixed f/2.2, again same as that of iPhone 5S. The next thing is True Tone flash, which is great. It’s a dual-colour or dual-temperature flash that has each colour firing at varying intensities based on the scene to make sure colours and skin tone stay true and the photos looks natural and great. This is something which has not been on any other smartphone yet. 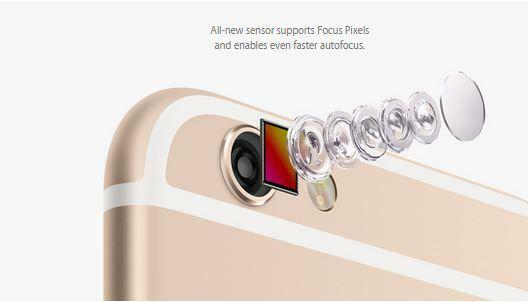 Another new feature that iPhone 6 got is Focus Pixels, iPhone 6 and iPhone 6 Plus both have phase detection autofocus instead of contrast detection AF. The iSight’s camera has pixels paired for phase detection autofocus, basically like using an old range-finder camera or SLR. As the lens or module in the iPhone 6 and iPhone 6 Plus move forward and back, these phase detection pixels on the sensor will determine when your subject is in focus and stop the movement. And you’re good to take the perfect shot. There is a huge difference between iPhone 6 and 6 Plus in this case. In the iPhone 6, there is digital image stabilization. This means that it’s likely that software is working in keeping your image sharp even if there is slight movement in the camera. The iPhone 6 Plus, however, gets the better end of the deal with OIS, or optical image stabilization. With this, the lenses, or elements, or camera module or a combination of any of those three will move to counteract the motion of the phone itself. iSight camera has been one of the best part of iPhone and it has been always considered that iPhones have got the best point and shoot cameras. The iSight cameras on the iPhone have always done a pretty good job at nailing exposure and reducing motion blur, along with taking decent photos in low light. Though Apple didn’t reveal any great deal of information about the image quality of the iPhone 6 and 6 Plus cameras, but we can expect that with the new iSight camera packed with tons of features, the image quality will also be greater than ever. These are the few things which have been perfected for better photography with your iPhone and expect that iPhone 6 and 6 Plus will be even better than previous ones, which were called the best camera phones available out there for mobile photography.